sew cherry 2... — hello, y'all. have you been following lori holt's sew cherry 2 sew-along? if not, it's not too late. you can download the pattern here and follow along, making each block, from lori's blog here. these blocks are so much fun to make. 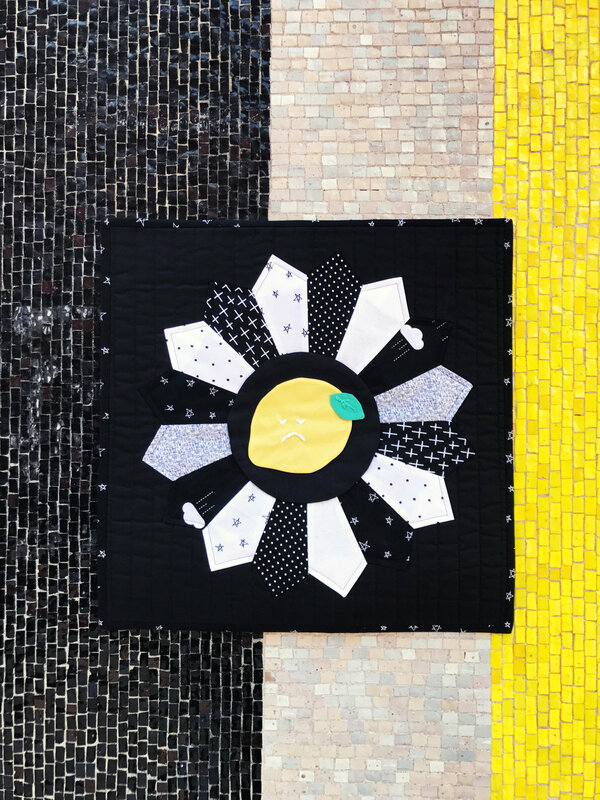 lori's finished quilt features her sew cherry 2 fabric collection for riley blake designs. isn't it delicious? i haven't met lori in real life (yet! ), but i love everything she does. she started her company, bee in my bonnet in the early 90's and hasn't stopped since. she currently has 4 fabric collections and 3 on the way for riley blake designs. her attention to detail and sweet prints melt my heart. i also love her nostalgic view that inspires her work. it feels like home. in order to complete lori's sew cherry 2 blocks, you'll need her "pie wedge" and a set of her "fruit salad" templates. and if you haven't already, run, jump, and skip to buy her cutting mats and rulers. they're ahhmazing! i knew i wanted to mix things up a bit and create something in my graphic, bold style. i started curating fabric from my favorite collections: creative rockstar by rad and happy and when skies are grey from simple simon and co. with a little sprinkle of hashtag and swiss dots, it became the perfect recipe for a dresden, don't you think? making the dresden block is really easy, especially with lori's fool proof instructions. the hard part--deciding if you want to make a mini from your block or an entire quilt. of course, i made a mini. i machine quilted my mini before adding the dresden. i then added the dresden following her instructions. easy peasy, lemon squeezy (see what i did there? haha!). next you need to add the fruit to the center of your dresden. using lori's "fruit salad" templates is a piece of cake. you simple follow her instructions and you'll be making your own fruit salad in no time. i added a little face to my lemon, making him extra sour. he's so cute! that personality! i love it. i hope you'll follow along and make your own version. dresden blocks, while traditional, can be made modern too! i'm excited to see what you make!